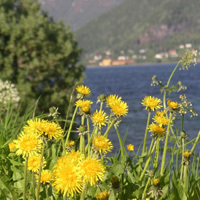 Inspired by Johanna’s thrifty thoughts about dandelions this May 2009, I am including my best dandelion leaf recipe. Dandelions are nature’s own gift to you in the Spring as their leaves have a strong cleansing effect on the kidneys and gallbladder. Dandelion leaf has a bitter flavor which you can tone down by soaking for a half an hour or so in water before using in salads and other foods. The slightly bitter, leafy green taste of dandelion leaf complements barbecued meats and vegetables perfectly. Soak the leaves in water for 1/2-1 hour. Pat dry and chop roughly. Blend in a food processor with the remaining ingredients until the mixture has become a smooth paste. If you want a real lift this May, I suggest you try the light lunch prepared in under 10 minutes that I enjoyed today. What was it that I prepared and ate? Asparagus. What is that doing in the Nordic Wellbeing Cookbook, you might ask? Doesn’t that grow in a sandy, dry environment somewhere where it is much warmer? In actual fact, asparagus is a hardy plant that grows in a wide variety of climates and can even tolerate frosts. 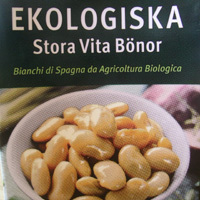 Asparagus from Gotland has become a delicacy in Sweden, for example. During the past decade asparagus has become a favorite of Nordic kitchens during the warmer, lighter season. What’s so good about asparagus from a health point of view? Just a few of its many virtues include that it is a great source of vitamin C, B2 and one of the richest existing sources of B9 (folates) among other essential vitamins and minerals. If you’ve got diabetes, gout or fluid retention you’ll want to eat more of it. It’s also one of those foods that you don’t have to buy organic since it has relatively low pesticide residues. Since it doesn’t have a long shelf life, it’s one of those vegetables you’ll have to eat relatively fresh. There are, of course, also frozen options. A more long-standing great favorite of the Nordic kitchen is the potato and these combine beautifully with asparagus for a delightful and satisfying meal. If you’ve got any of those boiled potatoes left from last night’s meal, don’t throw them out! They will make a perfect lunch with asparagus. Wash the asparagus, cut off the hard ends of the stalks and place in a pan just covering with water. Sprinkle in a little salt. Bring to boil and allow to simmer for 5 minutes. Pour into a sieve, draining out the hot water and rinse immediately with cold water so that the asparagus retains its crispness. If you’ve got an asparagus cooker (steams the asparagus upright so that it cooks more evenly and preserves more of the nutrients) it will take about 10 minutes. Cut the potatoes into quarters and divide between two plates. 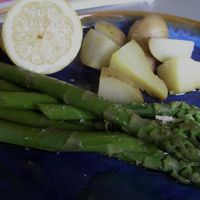 Divide the asparagus into two quantities and pile next to the potatoes. Drizzle potatoes and asparagus with oil and serve with a half a lemon for squeezing over just before eating. This dish is as divine as it is simple. P.S. Kids and adults alike love it.